KATALOX LIGHT ® is a new brand of revolutionary advanced filtration media completely developed in Germany. Its composition simply makes it outstanding against the contemporary filter media available in water treatment industries, like sand, BIRM, Greensand Plus, Manganese Greensand etc. KATALOX LIGHT ® is manufactured in Germany. KATALOX LIGHT ® is engineered with unique MnO2 coating technique on ZEOSORB®, providing it light weight, higher filtration surface, more service life and more reliable performance (filtration down to 3 µm) than any other existing granular filter media. 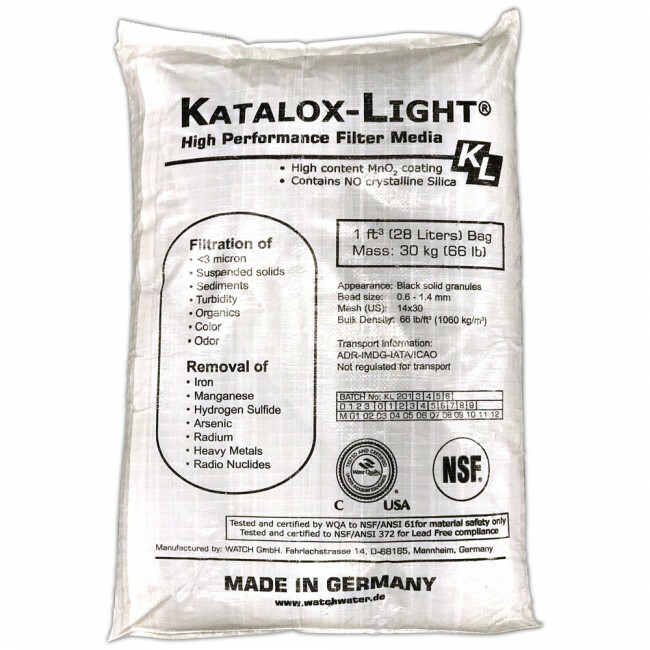 KATALOX LIGHT ® is being used in numerous systems for residential, commercial, industrial and municipal applications worldwide, for High level filtration, color and odor removal, Iron, Manganese, Hydrogen sulfide removal, efficient reduction of Arsenic, Zinc, Copper, Lead, Radium, Uranium and other radionuclides and heavy metals. KATALOX LIGHT ® is ANSI/NSF 61 Certified for drinking water applications and has met the ANSI/ NSF 372 Lead free compliance. Advanced use High concentration coating of MnO2 on the KATALOX LIGHT ® surface (10%) is the biggest advantage compared to any similar product available in the market. This makes the oxidation and co-precipitation of contaminants much more effective. For removal of very high concentration of contaminant it‘s recommended to use H2O2 as an oxidizer, which provides accelerated catalytic oxidation on the surface of the media. Conventional oxidizing agents like chlorine or potassium permanganate also could be used if required. KATALOX LIGHT ® can be used for Arsenic, Radium, Uranium removal but in these cases there is requirement of Iron in the water. KATALOX LIGHT ® system is designed with special iron dosing technology which has many advantages over Adsorbent media used for Heavy Metal removal. The future of water treatment, as we see it, is going to give us more difficult challenges and we all need more advanced and robust products. In Watch Water®‘s vision, KATALOX LIGHT ® can be addressed for advanced concepts like Water Reuse, Controlled Adsorption of Arsenic and Heavy Metals, advanced Membrane pre-treatment, Zero-Discharge Cooling tower etc. Contact us for information. Watch Water® KATALOX LIGHT ® systems offer a new technology with advanced catalytic filtration available in water treatment industry. All systems have been engineered keeping both professionals and consumers in mind. Systems are available with different models and customized for manual backwash without using electricity or it can be made fully-automatic. System can be used in a variety of applications including residential, commercial and any process water applications for food and beverage industry. Standard systems are designed with a filtration velocity of 20 m/h (8.2 gpm/ft2) to provide a good filtration. This value may differ for advanced application like Arsenic, Radium, Uranium and otherheavy Metal removal where co-precipitation process requires higher contact time thus lower filtration velocity. Running the system at higher velocity may compromise the filtration performance. Virtually there is no flow rate limitations for KATALOX LIGHT ® systems as KATALOX LIGHT ® units can be configured in parallel to address industrial high flow requirements.